In 2018, we released over 50 new features and optimizations to the TrustSpot platform. These new features have allowed our community to capture more reviews, increase customer loyalty and offer new ways to display visual content. For Q1 2019, our focus will be to introduce new ways for customers to share their experience with you and to their friends across multiple platforms and devices. This means launching more integrations, deeper customization, and more rewarding experiences. I look forward to sharing all of these exciting new features with you in the coming months. As always though, if you have an idea for an Integration or a new feature, please Let us Know. Due to the size of this release, you can use the links below to skip to a specific section. You now have the ability to customize the email content of each individual Smart Reminder, including the: Subject Line and Email Content. To help with the transition, your existing email content has been copied over to the new Smart Reminders area. You can now visit the Smart Reminders section, and customize each template to create a unique follow up experience for your customers. Responding to customers is a great way to resolve issues or to thank them for purchasing from your business. 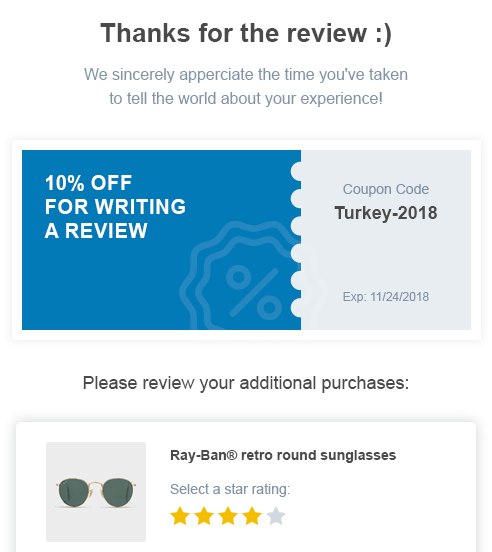 This new update, now sends you an email notification if the customer goes back and updates their review after you respond to them. To enable this feature, visit: Account Settings > Email Preferences, and select "Customer updates review" then click Save. 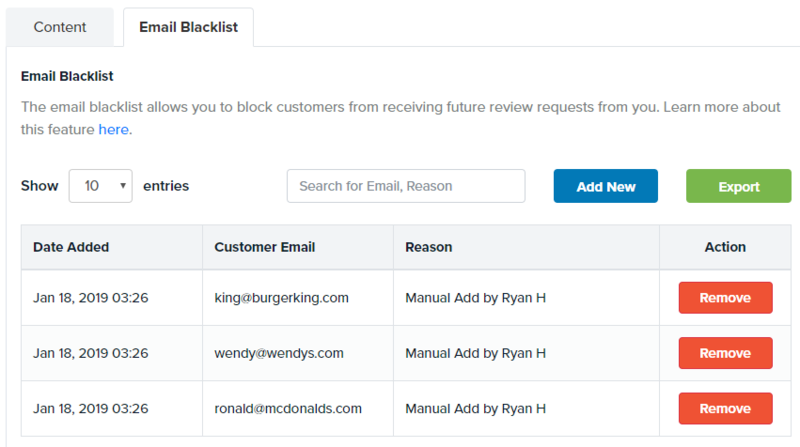 Based on feedback received, we updated the Email Blacklist feature to now allow for Bulk Uploads, and Exports. The Bulk Upload feature will be helpful if you're wanting to better sync unsubscribes from your own customer lists into TrustSpot. Likewise, the Export feature now allows you to export a list of all customers who have unsubscribed from TrustSpot emails. Both features are meant to give you better visibility into your customers. We're also introducing a New Way to collect more reviews directly on the Thank you Page. Customers who have purchased more than 1 item in their shopping cart, will now be asked to review their other purchases, without waiting for an email. This feature is optional, but recommended as it will help to increase your overall review collection. To learn more about Thank You Page customization, check out our support guide. 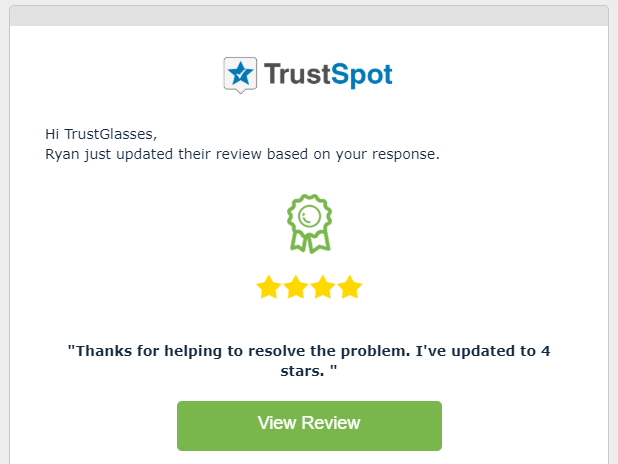 This feature allows you to send customers to a page on your website thanking them for their review, versus using TrustSpot's thank you page. This is a helpful feature, if you're wanting to display custom content to customers or push them into unique user flows on your website. To utilize this feature, visit: Marketing > Thank you Page, click "Self-Hosted" Tab. 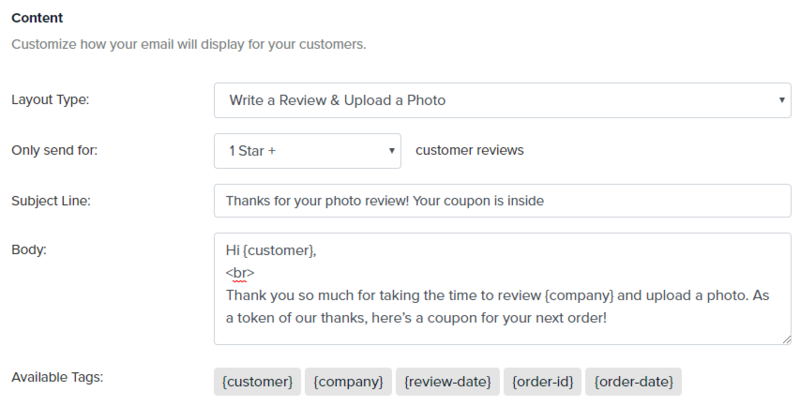 You now have the ability to customize the email content for each individual coupon event triggered by the customer. This update replaces our current Thank you Email page, which previously only allowed you to customize one email for all events. For Example: You may want to thank the customer for uploading that awesome product photo, or for thanking them for helping to answer a customer's question on your site. To utilize this feature, visit: Marketing > Thank You Email. Today, we are introducing a new type of Coupon Expiration that is based on the number of days versus a fixed date. This allows you to have more control over your coupons, and also create a sense of urgency if the coupon is expiring in 30 days. For example: If you set a coupon to expire in 30 days, this means the expiration will be generated at the time of the coupon being sent to the customer. So, if the customer writes a review on Jan 20, 2019 and the expiration is 30 days, than his coupon expiration will show as Feb 20, 2019. To learn more about our Coupon feature, check out our support guide. 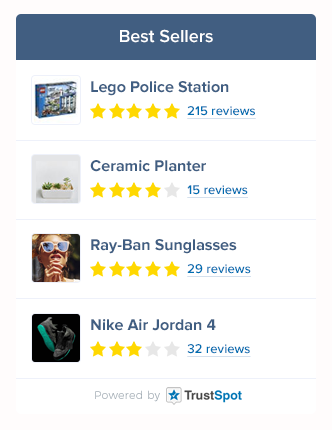 This new Trust Element allows you to promote your Top Rated, Best Sellers, Recently Reviewed or even custom selected products in a dedicated upsell area on your store. Prospective customers can click on each product to be taken directly to the product page. To learn more about Featured Products, check out our support guide. We're happy to announce that 2 new badge designs have been added into the system. You can fully customize the star color, type, background and text. The badge page also allows you to set a custom link. When a user clicks the badge, they will be taken to this custom link versus your profile page. 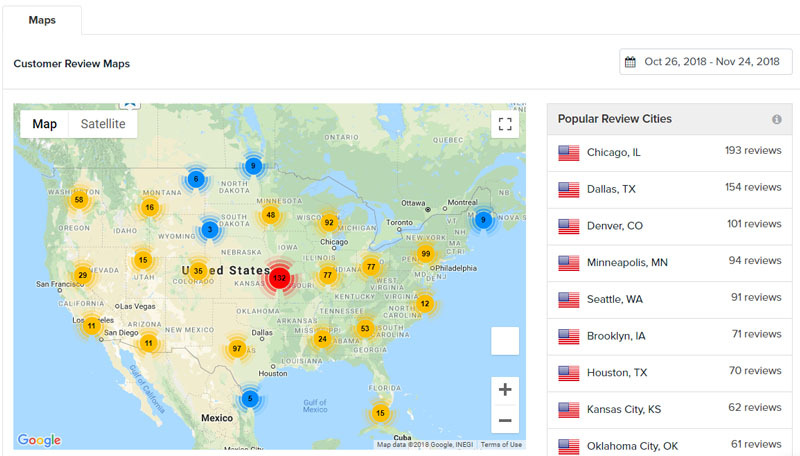 In early January, we introduced a new Analytics screen called Review Maps. This screen gives you a birds-eye view into where customer's are posting reviews around the world. You can also see your top cities on the right with the most reviews in a selected period of time. In addition to Review Maps, we also introduced a Customer Location feature in early December for both our Moderation areas, and also the Product Review Widget. To learn more about Review Maps, check out our support guide. Updated automatic category star insertion (new installs only, does not affect current). With every platform release, we not only focus on introducing new features but also improvements to existing items within the platform. Based on feedback, we're happy to detail out the miscellaneous improvements made to the platform in our late December and January release. Added the ability to import product tags in bulk from the Products page. [Performance Improvement] - Removed FontAwesome from Product Review Widget and replaced with our own icons. This reduction eliminates 60% of the total PR Widget Load Size. With our January release today, we're introducing over a dozen new features and optimizations into the platform. We're excited about our upcoming February release, which will focus on more ways to collect & display visual content, in addition to a few new integrations. As always if you have any suggestions, please let us know.